I have pulled everything together to have a treadmill desk to use for work and exercise at the same time. Now, for anybody who is not familiar with a treadmill desk, it’s a way to get some work done while walking. 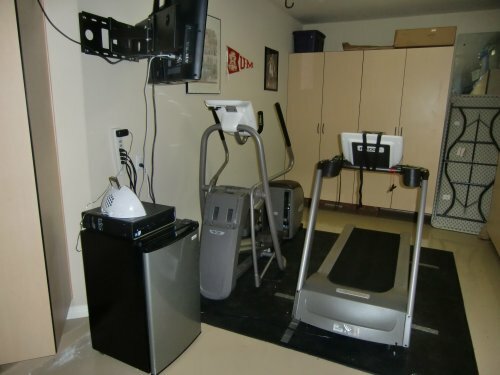 Some people build attachments to their treadmill, as well as free-standing desks to go up and over the treadmill. Since I’m not particularly handy, I relied on things that were available to purchase, and I’ll share all of the items I assembled to have a comfortable, productive environment for walking and working. The treadmill desk is setup in an area of my garage with a TV used as a monitor, desktop computer pulling in WiFi, wireless keyboard and mouse. 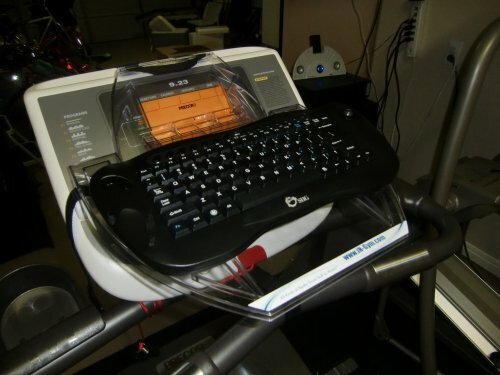 The three most important elements are the treadmill (Precor 9.23 Treadmill), the treadmill desk (SurfShelf), and the keyboard (SIIG Wireless Mini Multimedia Keyboard). Next up is the computer. 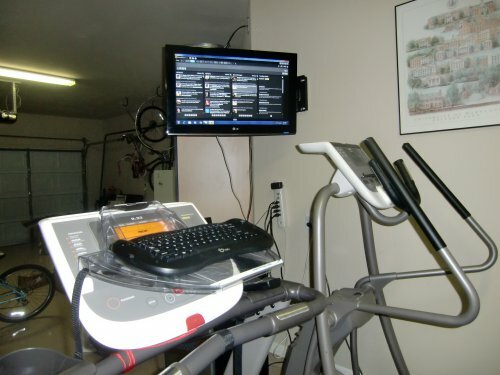 Some people work with a laptop on their treadmill desk. I sweat a lot, and didn’t want to kill my laptop, so I got a new computer (Dell Inspiron 560) that would sit far from my sweat. I got the slim-tower version with Intel Pentium dual-core E5800 (3.20GHz, 2MB); 6GB DDR3 SDRAM 3X2GB, integrated Intel Graphics Media Accelerator X4500; and 500GB NCQ Serial ATA Hard Drive (7200 RPM) w/ 16MB DataBurst Cache. One thing it didn’t come with was the ability to pull in a WiFi signal, and I don’t have a hard Internet connection in the garage. So I got a little USB network adapter (Cisco-Linksys WUSB54GSC Compact Wireless-G USB Network Adapter with SpeedBooster). 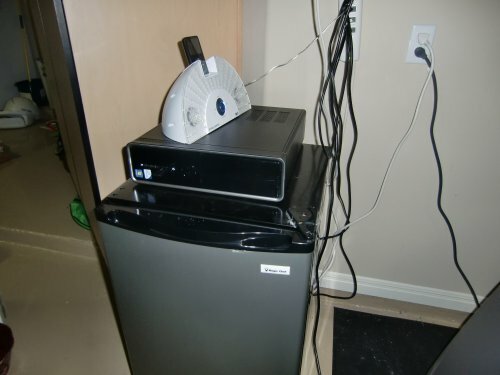 I’ve got the computer sitting on a little fridge near my treadmill desk – I need my cold water! That’s a little iPod stereo thing on the top, so I can play podcasts, music, and audio books when working. Finally, I use a 32″ LCD HDTV for a monitor (LG 32LD350 32-Inch 720p 60 Hz LCD HDTV). The TV/monitor is mounted to the wall with a bracket that swings out with a tilt and swivel articulating arm (CheetahMounts 32″-55″ LCD TV Wall Mount Bracket), so it can be comfortably positioned for either the treadmill desk or elliptical machine. I connect the TV/monitor to the computer with an HDMI Audio Video Cable that is 6 feet long. This setup enables me to do any of the tasks I usually would do at my desk, and once I had all of the pieces, it was easy to get everything up and running. I started out walking 4 miles per hour with the treadmill desk, but I found that was too brisk to get things done with accuracy. I played around with various speeds while working, and I brought it to around 3.5 miles per hour to keep moving, but still do everything I do at my old, wooden sit-down desk. If you’d like to see my progress, check out my dailymile profile.